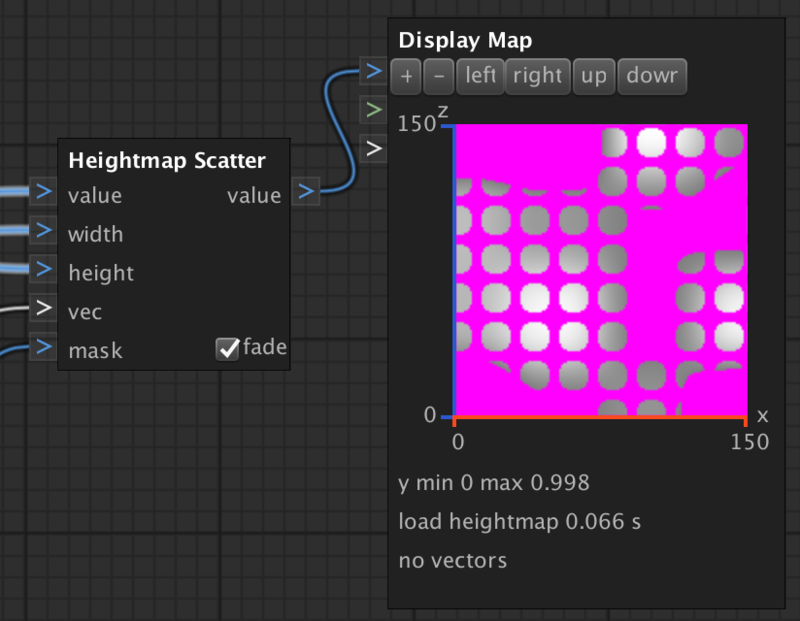 The HeightMapScatterNode scatters parts of a height map to a new height map. E.g. it can be used to scatter masks over your landscape. Notice the performance information of the 'fade option'. fade If fade is checked it fades the scattered height map parts using the mask. It if is not checked the node tests if a scattered height map part is completely covered by the mask. Notice: this is very computing intensive and can impact performance significantly. value The height map value to scatter parts from. width The width of the part to scatter. height The height of the part to scatter. mask A mask where to scatter to. It is recommended to use a mask for a better performance. The mask avoids to request height map parts at the masked x, z coordinate. The height map with scattered height map parts.